The incredible Sapphire Valley Resort, located in picturesque Cashiers, North Carolina, is truly the gem of the Blue Ridge Mountains. The list of exclusive, world-reknown and expensive Country Clubs on the Highlands-Cashiers Plateau is indeed plentiful and prestigious, including world-reknown Wade Hampton and Mountaintop. But none provide better value or offer more amenities than the Incredible Sapphire Valley Resort in Cashiers. Membership in the Sapphire Valley Resort is limited to those that own property in a community within the resort, those renting property in the resort or at an overnight lodging facility within the resort. Lots are available from $15,000 to $1.5m, available homes are priced from $189,000 to over $4million, and condos from $40,000 to $375,000. See below for a list of communities within the Sapphire Valley Resort. If you are considering a purchase in the area, make sure to speak with the area's real estate expert...BillKruck@gmail.com. I've got the most experience in the resort, with over 250 transactions in the Sapphire Valley Resort alone! The centerpiece of the Sapphire Valley Resort is picturesque Lake Fairfield. This 55 acre lake is one of the most beautiful spots in the world, with the sheer rock face of incredible Bald Rock Mountian above. 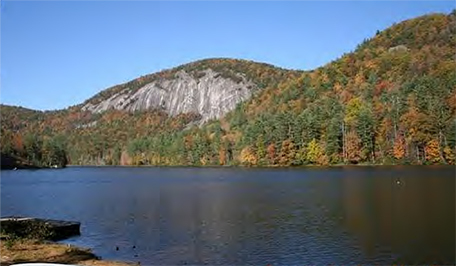 A 3-mile long trail surrounds the lake, or take the Bald Rock trail to the top, for the more advanced hiker. Swim to the floating dock from the beach, grill in the pavilion, or rent canoes, kayaks, paddle boats, trolling-motor boats or sail boats from the facility--you can rent fishing equipment and purchase live bait there as well. The north end of the lake houses Camp Merriwoode, an amazing setting for this nearly 100 year old girls camp. While the south end of the lake flows into an incredible waterfall which envelops the 13th green of one of the Sapphire Valley Resort's golf courses, the Sapphire National Golf Club. This incredible Sapphire Valley Resort Golf Club includes 3 of North Carolina's fabulous 18 holes including: Hole #2 - hit from the cliff side tee box to the green on the next cliff, Hole #13 - approach over this waterfall (shown above), or the difficult island green on Hole #15. 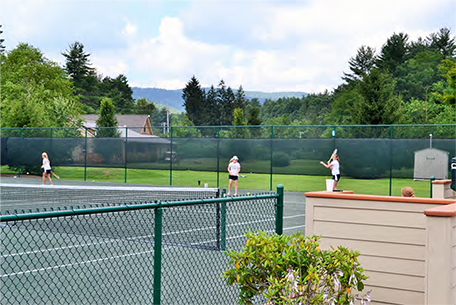 The Sapphire Valley Tennis Center includes 8 har-tru courts with an active schedule for lessons or tournaments. 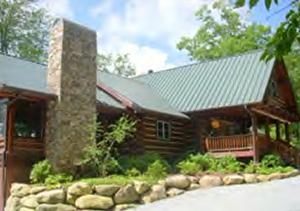 Activities at Community Center include social events, live music, private functions, Sapphire Valley Resort paraphernalia and a gathering place for journeys all over the mountains. Next door to the Sapphire Valley Resort Community Center is the Four Seasons Cafe along with the Sapphire Valley Resort Ski Lodge, where lift tickets can be purchased (seasonally) and equipment rental for the Sapphire Valley Ski Area. This spot is perfect for teaching new skiiers or snowboarders, or getting those legs fresh before a trip out west! The ski area houses the Kids summer camp, available hourly, daily or weekly all summer. 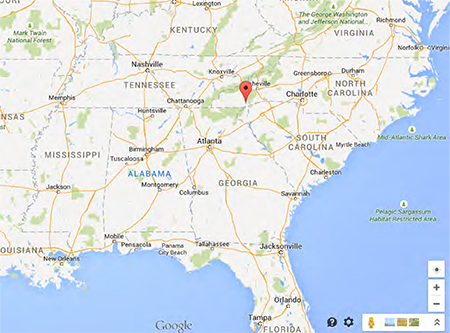 The Sapphire Valley Resort is located atop the Highlands-Cashiers Plateau, in the Western Blue Ridge Mountains, just 15 miles NE of the NC, GA, SC border.